The most rewarding part of what she does is watching her patients transform for the better, through her distinctive approach to manage challenging situations in their lives. She set out on a mission to empower people to find their distinctive ways to overcome frailties and specific conditions. Her techniques are proven successful and her capacity remarkable. 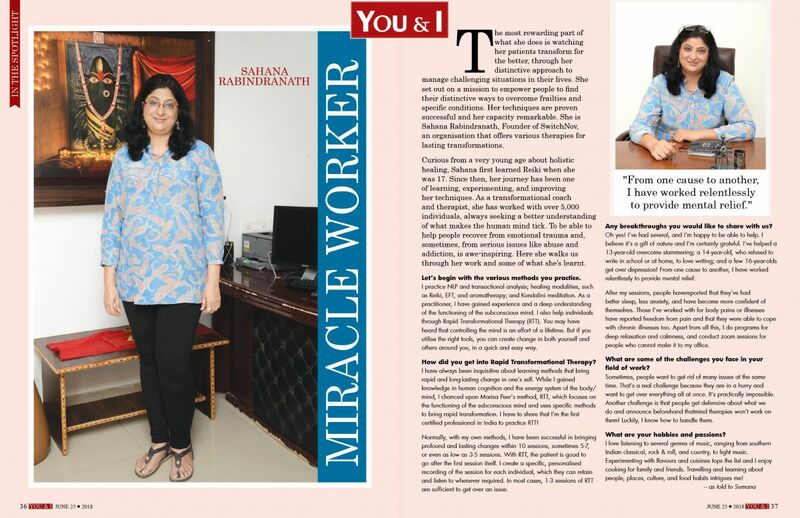 She is Sahana Rabindranath, Founder of SwitchNov, an organisation that offers various therapies for lasting transformations. Curious from a very young age about holistic healing, Sahana first learned Reiki when she was 17. Since then, her journey has been one of learning, experimenting, and improving her techniques. As a transformational coach and therapist, she has worked with over 5,000 individuals, always seeking a better understanding of what makes the human mind tick. To be able to help people recover from emotional trauma and, sometimes, from serious issues like abuse and addiction, is awe-inspiring. Here she walks us through her work and some of what she’s learnt. Let’s begin with the various methods you practice. I practice NLP and transactional analysis; healing modalities, such as Reiki, EFT, and aromatherapy; and Kundalini meditation. As a practitioner, I have gained experience and a deep understanding of the functioning of the subconscious mind. I also help individuals through Rapid Transformational Therapy (RTT). You may have heard that controlling the mind is an effort of a lifetime. But if you utilise the right tools, you can create change in both yourself and others around you, in a quick and easy way. How did you get into Rapid Transformational Therapy? I have always been inquisitive about learning methods that bring rapid and long-lasting change in one’s self. While I gained knowledge in human cognition and the energy system of the body/mind, I chanced upon Marisa Peer’s method, RTT, which focuses on the functioning of the subconscious mind and uses specific methods to bring rapid transformation. I have to share that I’m the first certified professional in India to practice RTT! Normally, with my own methods, I have been successful in bringing profound and lasting changes within 10 sessions, sometimes 5-7, or even as low as 3-5 sessions. With RTT, the patient is good to go after the first session itself. I create a specific, personalised recording of the session for each individual, which they can retain and listen to whenever required. In most cases, 1-3 sessions of RTT are sufficient to get over an issue. Any breakthroughs you would like to share with us? Oh yes! I’ve had several, and I’m happy to be able to help. I believe it’s a gift of nature and I’m certainly grateful. I’ve helped a 13-year-old overcome stammering; a 14-year-old, who refused to write in school or at home, to love writing; and a few 16-year-olds get over depression! From one cause to another, I have worked relentlessly to provide mental relief. After my sessions, people havereported that they’ve had better sleep, less anxiety, and have become more confident of themselves. Those I’ve worked with for body pains or illnesses have reported freedom from pain and that they were able to cope with chronic illnesses too. Apart from all this, I do programs for deep relaxation and calmness, and conduct zoom sessions for people who cannot make it to my office. What are some of the challenges you face in your field of work? Sometimes, people want to get rid of many issues at the same time. That’s a real challenge because they are in a hurry and want to get over everything all at once. It’s practically impossible. Another challenge is that people get defensive about what we do and announce beforehand thatmind therapies won’t work on them! Luckily, I know how to handle them.